Adjective Antics, Games, a FREEBIE, and a GIVEAWAY! As you saw last week, my kids loved the scavenger hunt we took around school. We looked for nouns first, and then came back to the classroom to talk about adjectives and create our anchor chart. After we created our anchor chart, I asked the kids to come up with adjectives for each of the nouns they found. I didn't introduce adjectives before we left for our "hunt" because I wanted the information fresh on their minds as they sat down to write. I work in a school with a high ESOL population (around 70%) so I try to do as much scaffolding as possible. I noticed during the work period that many of the kids were just using color words. "Hands in the air, kiddos!" "Are color words the only kind of adjectives?" "So why am I only seeing color words on your recording sheets?" "Yes... Oh. You may only use ONE color word as an adjective on this entire sheet. 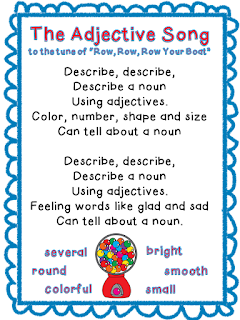 Use the anchor chart and your brain to come up with other adjectives that are more creative." This was just one of the "new additions" I put into the unit. I hope you'll click on over to check it out. We have played this several times during the last couple of weeks and my kids LOVE it!! During our planning one afternoon, we talked about playing a well-known fruity describing game with the kids. However, because we work with such a large ESOL population and our inclusion students are all very visual, we needed something a little different. The picture cards worked beautifully for my struggling readers! They were able to play with confidence without having to worry about sounding out a word. So, like the "other game" students have to match adjectives with a given noun. However, in "Apply the Adjective!" there is a noun picture in the middle and students have to come up with their own adjectives to describe the noun. One person in the group is responsible for choosing "the best" adjective, and this responsibility rotates as the game progresses. The student who wins the round puts a "check mark" under the winning adjective column. Everyone else in the group writes it down. I added this step because I want them to remember the stronger adjectives they heard and saw - especially during Writers Workshop! If they were in charge of the noun card, they simply mark a line through the "my adjective" column for that round. I have 2 more versions I'll upload soon to my stores - a winter edition and a February edition as well. I found an adjective song on Pinterest , but there wasn't a printable option. So I made one! The kids and I have been singing this for two weeks and they LOVE it! They have even asked for copies for their Super Skills Journals. :) I hope it's something you can use. I tried clicking around yesterday afternoon to find the source of this fabulousness.. I found some nakey websites (EW!) but I never found the original blog. SO, if this is yours, please let me know!! Last but not least, a GIVEAWAY! I'm giving away every product I mentioned on the post tonight to ONE lucky winner! I'm even going to keep it simple. I'm making this a quick giveaway because I want the winner to be able to use all 3 Apply the Adjective games. Good luck! Just entered! I am a follower! 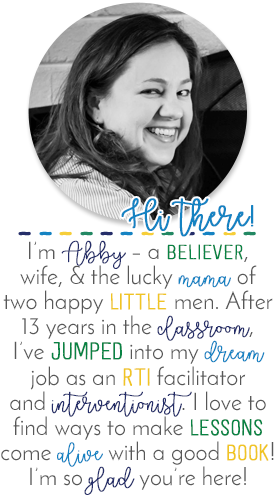 Abby, you ROCK! Hope you're having a great weekend!!! Have a great weekend. Thanks for all your great ideas. I am following you on both. Great ideas! Thank you! All of those activities look fantastic! My kids love when we do scavenger hunts! Anyway, I'm following your blog and FB page and entered your giveaway. Thanks!! Fingers crossed - but it's already on my wishlist just in case! I am your newest follower. I love finding other 3rd grade blogs!! Great ideas for adjectives! I just became a new follower. Love the adjective's song. We start talking about them Monday. Would love a game. These look fabulous . . . especially since we start our adjectives unit in a couple of weeks! THanks so much!! Games have had a rough ride in the press, with repeated causal links being with violence and then the "Hot Coffee" scandal with Grand Theft Auto. Now the industry's accusers are blaming it for addiction. Is it really true - are generator vbucks all bad? The general feeling is that video pokemon blog do not provide any benefits to the player and especially so in the case of children. This article makes an attempt to list some of the benefits that gamers enjoy whether they are toddlers or grandparents.